Dijon and Cote de Nuits Tour Includes: Our private tour of Dijon and Cote de Nuits includes private transportation and English speaking tour guide, taxes, tolls and parking. Not Included: Entrance fees, cost of wine tastings and any meals. Departure points: Beaune and vicinity. Other departure points available. Please inquire. Join us on a privately guided tour of Dijon and the Côte de Nuits. In the morning, you will tour the historic city of Dijon, with its well-preserved medieval center and marvellous mansions. 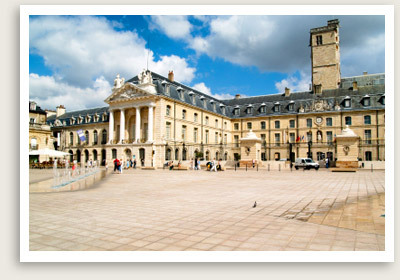 You will visit Dijon’s picturesque marketplace, where you will pick up some farm-fresh treats for your lunch. You will then drive toward the Hautes Côtes for a picnic in the countryside. After lunch, you will visit wineries in Vosne Romanée and Morey Saint Denis, in a section of the Côte d’Or called Côte de Nuits, and indulge in some wine tasting while in our private tour. Vosne-Romanée is known to produce some of the region’s best red wines, exclusively made from the Pinot Noir grape. Later in the afternoon, you will drive back to Beaune, enjoying the picturesque scenery of Hautes Côtes en route.